McConnell to Franken: "This Isn't SNL"
Just before Supreme Court nominee Elena Kagan was confirmed yesterday, Senate Republican Leader Mitch McConnell was making his case against her -- a case Democratic Sen. Al Franken seemed to find quite comical. According to the Associated Press, Franken, who was presiding over the Senate at the time, whispered and made wild gestures as the minority leader laid out his argument. It was distracting enough that McConnell approached Franken afterward to say, "This isn't 'Saturday Night Live,' Al." Franken, a former comedian who used to work on the late-night comedy show, immediately went to McConnell's office following Kagan's confirmation in an attempt to apologize, but McConnell wasn't there. According to the AP, Franken delivered a handwritten apology instead, and issued a statement saying McConnell had a right "to give his speech with the presiding officer just listening respectfully." 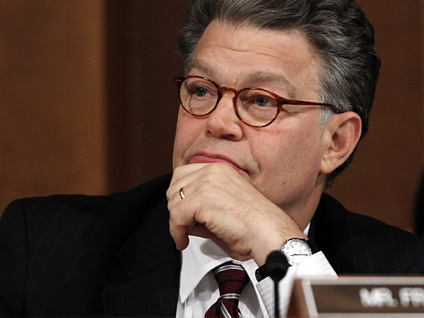 This wasn't the first dust up Franken has had with another senator while serving as the Senate's presiding officer. Last year, he was chided for cutting off Sen. Joe Lieberman's comments during the health care debate. Franken's past experience on SNL is unusual for a senator, but he has tried to tone down his comedic inclinations in Congress.